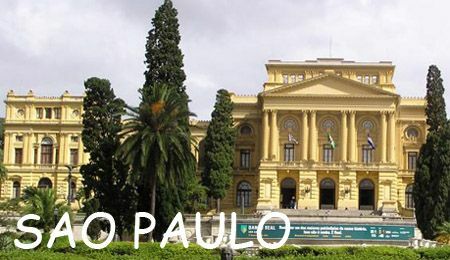 Attractions include the baroque Teatro Municipal, Niemeyer's Edifício Copan, the Museu de Arte de Sáo Paulo (MASP) and the 16th-century Patío do Colégio. 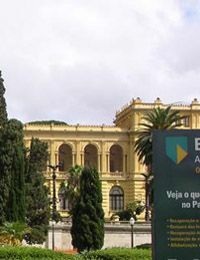 The city is southwest of Rio and you can fly from there in less than an hour or take a six-hour bus ride. Parque ibirapuera is an oasis in the midst of the concrete jungle of Sao Paulo, Ibirapuera Park stands out like a green thumb. You'll see a myriad of shapes and sizes of joggers on the 1,500 meter jogging track designated for "cooper," which has become slang for jogging in Portuguese. The park, which was designed by Oscar Niemeyer--the same architect who designed Brasilia--also has four lakes, 13 multiple-use sports courts, huge expanses of grass and a wonderful plant nursery. The Japanese population of Sao Paulo is well represented by a beautiful Japanese pavilion, constructed in the park in 1954, that includes an exact replica of the Katura Imperial Palace in Japan. A small fee must be paid to gain access to this place, which is surrounded by Japanese gardens. Of special note is the small lake, with multi-colored carp leisurely swimming in a harmonious display of random beauty. The park also contains the Planetarium, the Aeronautic Museum, the Folkloric Museum and the Modern Art Museum. Parque Zoologico de Sao Paulo (sao paulo zoological park) offers over four kilometers of trails as you wind around one of the best zoos in South America this interesting place. With a collection of over 2,700 animals, there is something for everyone. Of particular note are the monkey islands that have been set up in the middle of a small lake. Here you can see the animals at play outside, without any constraints except the water. Also interesting is the sheer number of different species of local flora that has also found its way, seemingly unplanned, into the zoo. Feeding time at the hyena cage is especially eerie, as the beasts laugh and howl in anticipation. The zoo is located about half an hour out of city center. Arrange for a round-trip taxi ride. Open daily 9am-5pm. 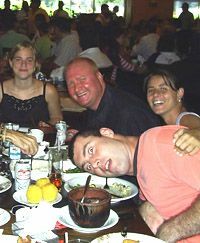 Learn Portuguese in São Paulo,enjoy your Portuguese learning vacation in this important financial center and the largest city in South America! :: Arrive independently into San Paulo. 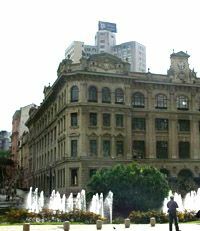 Astride bustling Paulista Avenue, the Jardins neighborhood offers São Paulo’s most fashionable shopping district - full of upscale boutiques, coffee shops, restaurants and art galleries. Our school is located in the upscale neighborhood of Jardins, blocks away from Paulista Ave., offering tree-lined streets full of neighborhood restaurants & bars as well as many green parks to explore. We believe that a language program must be complemented with a wide range of social and cultural activities not only to allow students to use and practice the Portuguese language but also to maximize student exposure to Brazilian and Portuguese culture. 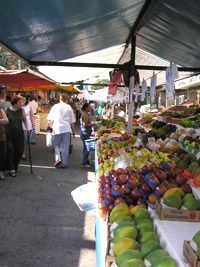 Enjoy social & cultural outings during the week: Rua Vinte e Cinco de Março, a traditional street in São Paulo, regional music attractions, rustic restaurants optional excursions to local cities Niemeyer's Edifício Copan, The Museum de Arte de São Paulo, 16th-century Patío do Colégio or the the beach only 40 minutes away. 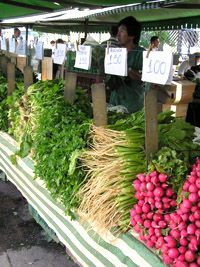 Culinary: Instruction in preparation and history of typical Brazilian cuisine. Rhythms and Dances: Experience the variety of cultural heritage in Brazil through dance classes. Capoeira: Classes in the Brazilian martial art/dance considered to be an essential part of cultural heritage. Photography: Study Photography at a well-respected Photography school against the colorful backdrop of Sao Paulo. 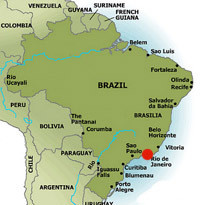 You will probably arrive into Sao Paulo airport, located 16 miles (30km) northeast of Sao Paulo. Taxis are available outside the terminals; visitors are advised to take the prepaid taxis, they are usually a little more expensive but give peace of mind. There is also an airport shuttle bus, which drops off at the main hotels. Public buses are also available.